This text by MARISSA NEAVE is published alongside DAX MORRISON‘S The Willing and Able exhibtion. It’s a rare thing for galleries to find themselves as the subject of an artist’s exhibition. Yes, there have been plenty of artists who have staged interventions within a gallery space (Vito Acconci); some who have made galleries the subject of their visual work (Michael Merrill); more who have temporarily modified the purpose of the gallery (Rikrit Tiravanija). But galleries–specifically, representations of Toronto ones–lie at the forefront of Dax Morrison’s The Willing and Able, in a way that, though visually abstract, clearly eschews the hierarchical constructs of an art scene, quietly redefines a community as such, and sharply highlights a methodical process in a smirk-ridden nod to conceptualism. 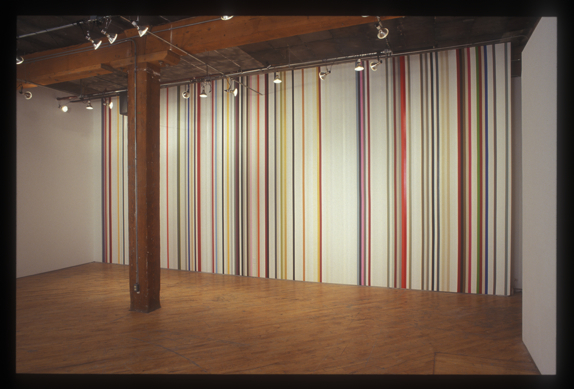 The Willing and Able seems simple enough, with tall, lean vertical stripes of multi-coloured paint covering one wall, while a long list of Toronto galleries, in alphabetical order, sits on a perpendicular wall in undecorated black type. Although the visual result of Morrison’s installation appears minimalist in style, the precision with which it is implemented is highly (and obviously) labour-intensive. There are two-hundred and twelve, 1 5/8-wide stripes in total, each painted flush with the next and stretching from wall to wall, floor to ceiling. The stripes themselves, painted using samples collected from the listed galleries, are ordered according to the alphabetical listing. Morrison’s regimented practice for this exhibition started in January 2009, when he began crafting an extensive list of Toronto art galleries. Scouring the usual sources–Now Magazine, Eye Weekly, Mass Art Guide, Slate and the Yellow Pages–Morrison effectively establishes a text-based representation of the Toronto art scene, one that would lay the groundwork for his site-specific installation at YYZ. Morrison notes that galleries are usually divided into smaller subsections (private, commercial, public, artist-run, rental) and that this hierarchy is, he says, constantly being reinforced not only between the different types of galleries, (an exhibition at a public gallery is more desirable than one at a monthly rental space), but also within these different segments, (one commercial gallery is better than another because it sells more or has higher profile artists). Morrison wanted to present all of these spaces as equal participants in an art-based community, and in order to do so he uncovered the most common denominator amongst them: paint. There is a level of tedium that laces every point of The Willing and Able, much of which existed prior to the exhibition itself and namely with Morrison’s attempt to establish contact with the galleries on his master list and finally collect the paint samples. Taking the list he developed in January (and continually updated through June), Morrison began getting in touch with the galleries, first by email or post (if an email address wasn’t available in the guides he consulted), and then in person. Patience and perseverance were at the crux of this process as, Morrison observes, each gallery is truly its own entity, and what might convince one gallery to participate doesn’t necessarily work with the next. If there’s a large staff then you sometimes end up in a guessing game with regard to whom to ask. In other circumstances, you hope that the message you leave with the reception desk makes its way to the owner/director/decision maker(s). Although his primary aim was to acquire a small sample of paint, his first goal was to get a response and a simple yes or no would do. The participants–the willing and able–were visited again to collect the sample. The extent of toil employed by Morrison to enact The Willing and Able is finalized in the painted wall. Witnessing the installation of the project, one encounters roll upon empty roll of blue painter’s tape, painstaking climbs up and down a ten-foot ladder, hundreds of paint samples organized and arranged so they may be applied in the correct sequence. The result is visually sparse but requires acute patience and attention to detail to execute, particularly as well as Morrison has. It is, as he describes, a painted wall, but knowing the timeline of how that painted wall came to be is what makes The Willing and Able an extraordinary example of meticulous care and conceptual methodology; a methodology that Morrison has long excelled at. Take, for example, The Rent Gets Paid; Toronto, a 2006 work that employs a similar methodology and visual effect. The process-driven piece is culminated in a single framed work that features a grid of red dotsthe international gallery symbol for SOLD . Collected from ninety-two Toronto-based commercial galleries (or non-commercial spaces that occasionally sell artwork, like Open Studio and Red Head), the list was developed in the exact fashion that the list for The Willing and Able was. The dots are equally spaced along the matboard from left-to-right and top-to-bottom, according to the alphabetical listing of participants. Although the ubiquitous symbol is in and of itself rather innocuous, seeing ninety-two of them side by side reveals how loaded the red dot is within the context of an art gallery. The piece is a reminder of the diversity allowed within the term–the range in size and hue unveils how uniquely this symbol correlates to the institution it comes from. It likewise evidences the difficulty institutions themselves can have with the entire concept of the red dot–Clint Roenisch rejects the shape of the symbol in favour of a red star, while it is the colour itself that moves Jessica Bradley to opt for an orange dot instead. The same rejection of convention can be seen in The Willing and Able, where multi-coloured stripes punctuate the many shades and finishes of the white and grey stripes that surround them. What does The Willing and Able and, certainly, the rest of Morrison’s oeuvre, say about convention, neutrality and hierarchy? For one, attempts to steer clear of either often seem sadly unavailing–in the case of Roenisch and Bradley, the desire to avoid the red dot ends up establishing a new one that fulfills the same communicative goal and carries the same symbolic meaning. As for the stripes in The Willing and Able, everything ends up looking like a neutral colour, even the bubblegum pinks and emergency oranges (noticeably, there are multiple samples of each). Morrison’s great effort is to treat each paint sample, each red dot, with equal space and unbiased sequence. In doing so he reveals not only the multiplicity between galleries, but also the common threads that link all of these spacesand the people who visit them, and the artists who show in themtogether. MARISSA NEAVE is an emerging writer, researcher and curator. She is currently studying Criticism and Curatorial Practice at the Ontario College of Art and Design with a special interest in microgranting and engagements between art, spaces and audiences. Neave works as the Communications and Programming Assistant at YYZ.